Former Liverpool stars Luis Suarez and Philippe Coutinho would have taken extra pleasure ridding Manchester United from the Champions League on Tuesday night. For Coutinho, whose Barcelona future has been under scrutiny, the joy of scoring a beautiful third goal will have been an added relief. 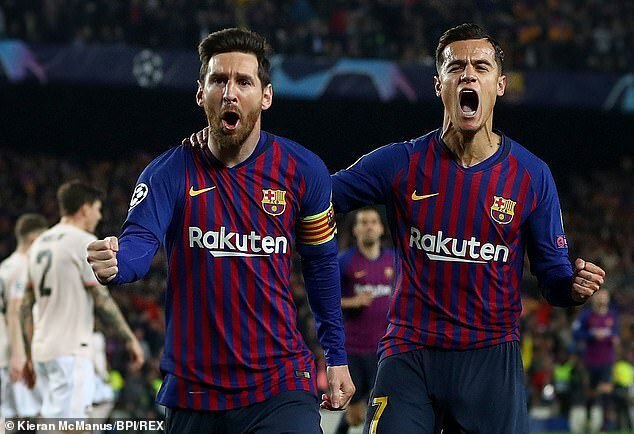 The affection Lionel Messi showed him during the celebrations indicated Coutinho remains a popular member of the Barca team and the Brazilian responded to his critics by cupping his hand to his ears. Even better for him and Suarez is that an emotional return to Anfield now awaits for a Champions League semi-final – provided Jurgen Klopp’s side don’t coll their second leg against Porto. Suarez and Coutinho were Liverpool’s key players in their thrilling 2014 title chasing team – Koppites must hope their dismantling of Manchester is an omen for their own race this season against City. But it is a different Suarez and Coutinho in Barca colours to the players adored on Merseyside signed by Kenny Dalglish and Brendan Rodgers. At Liverpool, they were the go-to players, with the pressure on them every week to deliver. With Barcelona, they are the sideshow to Lionel Messi. It can create some frustration but overall the South American pair are responding well to servicing the greatest player in the world, and then exploiting the space when United’s defenders concentrated too much on the Argentine. It’s one of the reasons they were both keen to go to the Nou Camp. It wasn’t just the glamour, history, climate, surroundings and pay packet at Barcelona. The chance to play with Messi is like being asked to form a doubles team with Roger Federer or write a song with Paul McCartney. 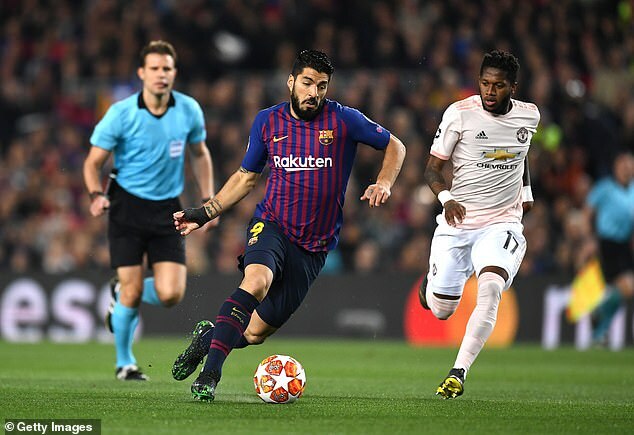 United started well and it was Suarez, whose body shape was pointed out in unflattering terms when Barca won the first leg 1-0 at Old Trafford, who broke the momentum with a barnstorming run into the opposition box. Though nothing came from that particular move, it gave Barca encouragement and Messi put them ahead by stroking the ball into the bottom right-hand corner a couple of minutes later. Barca played a traditional 4-3-3 with Messi on the right, Suarez in the middle and Coutinho on the left. The position looked more to the Brazilian’s liking than the central berth he’d been given soon after his move to the Nou Camp in 2018 where he was a pale imitation of Xavi and Iniesta. Particularly impressive from the 26-year-old was his workrate and persistence. 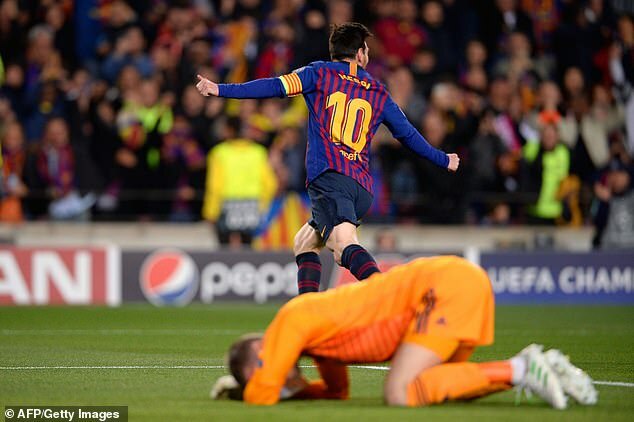 It was that which created Barca’s second goal, losing possession and then fighting to win it back, that gave Messi the chance to make it 2-0, albeit via a horrible error from David de Gea. With a 2-0 cushion thanks to Messi’s double, Suarez and Coutinho felt freedom to try it on a bit themselves. Ironically, they got in each other’s way when Messi’s headed into the box for them to latch onto. At 32, Suarez showed the old fire and temper are still there by lambasting a linesman who awarded a foul against him when he tried to barge through the United back line. Coutinho has had mixed reviews in Catalonia since becoming the world’s first £100million footballer. But preferred to Ousmane Dembele for this game, he looked comfortable in his own skin, one dribble into the box was vintage Coutinho while he took responsibility for Barca’s corners – and delivered them well. The icing on the cake was a wonderful curling effort over de Gea from 20 yards to put Barca 3-0 up and kill off any lingering United hopes. What was significant was the reaction from his team-mates. They rushed over to acclaim the goal, genuinely pleased for the scorer. Messi planted two kisses on his team-mate’s forehead. 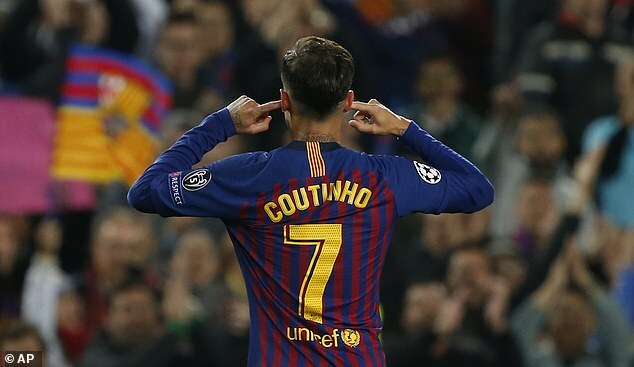 The Argentine’s view carries a lot of sway at the Nou Camp and it looked a sign that he wants to Coutinho to stay. Suarez then tried the same lofted finish move over de Gea. His effort finished of the roof of the net but he won’t mind. A return to Anfield, and a hero’s reception, is in the offing.